A large crowd followed along as Jesus was frog-marched through Jerusalem to Golgotha, the Hill of Skulls, for his execution. After being nailed to the cross and hoisted into the air, soldiers, officials and ordinary citizens gathered close, curious to see what would happen next. The soldiers mocked him and divided up his clothing. Mary and the disciples stood in quiet grief at a distance. The emboldened crowd hurled insults at him and challenged him to perform a miracle to save himself. 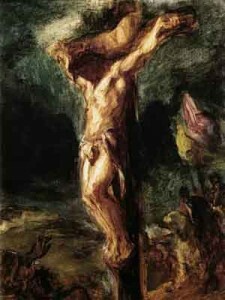 Today is Good Friday, the day on which Christians remember the trial and crucifixion of Jesus. He was beaten, flogged, abused in various ways, nailed to a rough wooden cross and raised up among criminals as an example of Roman justice. All four Gospel accounts record overlapping versions of these events, and all agree that he died sometime in mid-afternoon, in time to be taken down and buried before sundown. The crowd couldn’t know what would happen, but they seem to have believed it was possible, if only remotely so, that God would somehow rescue Jesus. “He saved others” seems to be a straightforward and perhaps unintentional witness to the signs and miracles that Jesus had performed throughout his ministry. In the years of his ministry he restored sight to the blind, cured lepers, healed the sick, gave crippled men back the ability to walk, raised the dead… And always, he claimed to be able to forgive sins, to wash away the wrongs that had erected a barrier between ordinary men and women and the holy God of Israel. What they didn’t know was that he had no intention of saving himself, no desire to save himself. Only the night before as he had been praying in Gethsemane, he is recorded to have asked God to save him from what he knew was coming the following day. He ends that prayer saying, “…not my will, but Your will be done.” He was yielded to God’s plan. Once the whole terrible last act was set in motion, Jesus willingly submitted himself to all that lay ahead. “He trusts in God” is again a very strange bit of mockery that acknowledges Jesus’ holiness. He was a man devoted to honoring God with his life, with his word, with his actions. Daniel and his friends trusted in God and were thrown into a furnace, only to be rescued from harm by God. Jesus’ friend Lazarus died, but was rescued by God from death. Jesus lived a life of prayer, self-denial, and obedience — indeed, the Scriptures say that he led a sinless life. Surely God would be pleased with this man and would reach down and lift him off of the cross? This may have been what was on the mind of the crowd that day. But it was God’s plan, God’s intention that he would bleed and die on that cross as the ultimate Paschal Lamb, the final Passover sacrifice, ushering in a new and permanent covenant between humanity and God. It was God’s plan that Christ’s death would redeem humanity and make us finally and permanently right with God. The crowd couldn’t begin to imagine the possibility that God would atone for our sins by placing his own Son on the altar of the cross; but if they had connected the dots from Abraham’s near-sacrifice of his son Isaac to that hill of death outside of Jerusalem, they would have understood, perhaps in horror, that because of his immense love for humanity, God would not intervene to save his own beloved Son. “He said, ‘I am the Son of God. '” In certain modern-day cultures, and in ancient Israel, this is a blasphemous claim. It implies equality with God. It suggests that God has somehow had sexual relations through which children were born. Jesus constantly drew on familiar earthly things as metaphors to explain the unseen and misunderstood things of God’s realm. It certainly shows the crowd had been paying attention. They may not have believed him, they clearly didn’t understand him, but there’s no doubt that they heard exactly what Jesus had been saying all along. Jesus Christ was the eternal God living in the form of an ordinary human being, having come to earth to proclaim God’s love and to be the atoning sacrifice for our sins. Reconciliation between God and humanity depended on Jesus’ willingness to be nailed to that cross, and on his humble acceptance of the agony and death that would follow. He quietly placed himself into his executioners’ hands out of love for us. He didn’t save himself, but on the cross Jesus saved you and me, some 2,000 years ago today on Good Friday. Image credit: Eugene Delacroix, 1845, Christ on the cross, oil on wood.